Home › Spiritual Growth › What is the Meaning and Significance of Gilgal in the Bible? What is the significance of gilgadh mentioned in 2king 2:1 – why the journey starts from gilgadh? Thanks for the question, victor! I assume you mean Gilgal, which is mentioned in 39 verses in the Bible. One of those verses is 2 Kings 2:1—the start of a story about the prophet Elijah being taken up to heaven in a whirlwind while the prophet Elisha, his apprentice, looks on (2 Kings 2). The name Gilgal has been associated by Bible scholars with at least five different possible locations in and around the Holy Land, none of them certain. But as we will see, it seems likely that “Gilgal” is not a town name at all. Instead, it is likely a word for a particular type of human-made site. 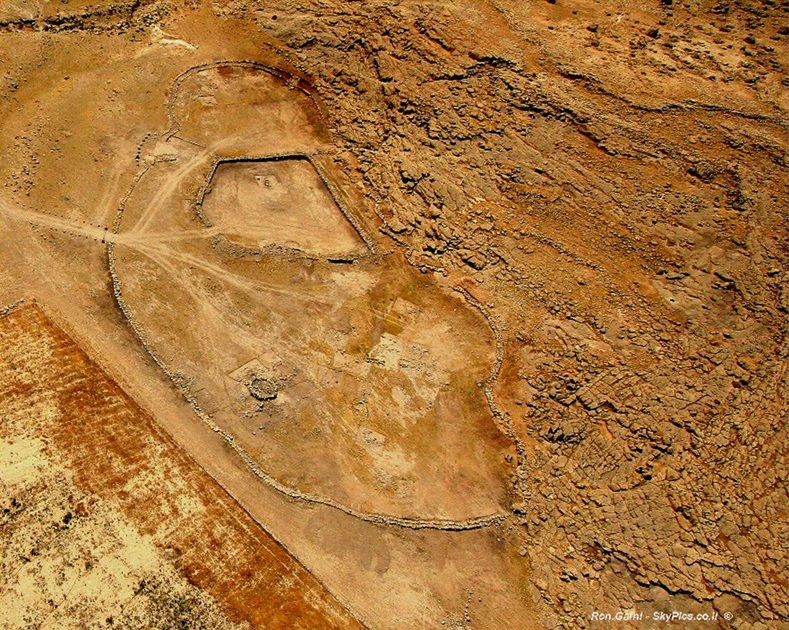 In recent decades archeologists have made some exciting new discoveries of ancient “Gilgal” sites! Though Gilgal is first mentioned in Deuteronomy 11:30, it gains its primary meaning and significance in the book of Joshua. The first camp of the Israelites after they crossed the Jordan into the Holy Land was at a place called Gilgal. This camp served as their base of operations during the initial conquest of the Holy Land under Joshua. Several other important events in the Bible take place either at this Gilgal or at a different one. Eventually, though, Gilgal became corrupt, and two of the prophets railed against it later in Israel’s history. In some ways Gilgal has a story similar to that of Bethel, which is covered in an earlier article: “What is the History and Importance of Bethel in the Bible?” However, as we will see in Part 2 of this article, “the gilgal” (as it should really be translated) has its own particular meaning in the Bible story, and its own special significance for our spiritual life. Okay, okay! I’ll spill the beans just a little . . .
As the Israelites’ point of entry into the Holy Land and their base of operations for the initial conquest of the land, the site called “Gilgal” signifies the simple, basic religious beliefs and teachings that first introduce us to a spiritual life, and that we return to again and again as we fight our early battles to reform ourselves and get our life into order. It’s all about stones and circles. Do you like to see where places are on the map? I do! Thing is . . . we don’t really know where Gilgal was. As I mentioned earlier, scholars have suggested at least five different locations for the various mentions of “Gilgal” in the Bible. Most of them are on the east side of Palestine, toward the Jordan. One is located on the western, Mediterranean side. The traditional location of Gilgal is just east of Jericho, based on Joshua 4:19. Here is a map showing this location. See the question mark? That’s because no location has been definitely identified as that of Gilgal. This is just the best guess of various Bible scholars. Though it doesn’t seem to agree with the location given in the book of Joshua, some scholars think Gilgal might be farther north—near the town labeled “Adam” on this map. That’s because back in the 1980s archeologists discovered a fascinating site there, which may have been connected to the ancient Israelites about the time of their conquest of the Holy Land. We’ll get to that in a minute. Why has it been so hard to locate Gilgal in the Bible? It may be that scholars and archeologists had been looking for the wrong thing. It was long assumed that Gilgal was the name of a town, like other towns mentioned in the Bible. But it’s possible, even likely, that Gilgal is not a town at all. The one exception is Joshua 5:9, which reads: “The Lord said to Joshua, ‘Today I have rolled away from you the disgrace of Egypt.’ And so that place is called Gilgal to this day.” That might be why we previously thought it was the name of a town. Everywhere else, it should really be “the gilgal.” This suggests that “Gilgal” is not the name of the town, but rather a type of place. People often refer to the nearest major city as simply, “the city,” rather than saying its name. People who live in suburban areas go to “the mall” to do much of their shopping. They may not even know the official name of their nearest shopping mall. People who live near a large natural waterway commonly refer to it as “the river,” even though they usually do know its name. In the Bible, the same is probably true of “the gilgal,” as it is almost always written in the original Hebrew. In other words, what is usually translated “Gilgal” is probably a type of place. And there might very well be several different Gilgals, as many Bible scholars have suggested. So what type of place is a “gilgal”? Like other words assumed to be place names, “Gilgal” isn’t a translation. It’s a transliteration into English of the letters in the original Hebrew word. It doesn’t give us the meaning of the Hebrew; it simply represents the sound of the original Hebrew word in Roman letters. However, the word gilgal does have a meaning in Hebrew. As suggested in the original Hebrew of Joshua 5:9 (quoted above), the word gilgal in Hebrew is related to the word galal, which means “to roll.” Galal is often used to refer to rolling heavy objects such as stones. So in Hebrew the related word gilgal means a wheel or circle, or something that rolls. In particular, it seems to refer to a circle of stones, or to a circular altar. 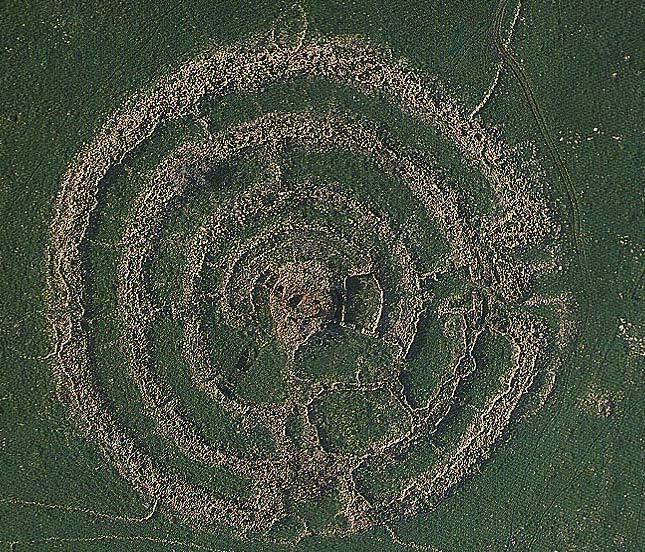 “Gilgal Refaim” is massive arrangement of four concentric stone circles, with a fifteen-foot-high circular stone mound in the center. It is estimated to contain over 42,000 large basalt stones. The largest circle is about 170 yards in diameter, and eight feet high. Archeologists believe it was built around 3,000 BC. This would mean that it was already over 1,500 years old when Joshua and the Israelites began their conquest of the Holy Land. This ancient “gilgal,” or stone circle, is located in the present day Golan Heights region, east of the Sea of Galilee. It is unlikely that Gilgal Refaim corresponds to any of the Gilgals mentioned in the Bible. However, a more recent discovery may very well be associated with the Biblical Gilgals. Starting in the 1980s, and continuing right up into the 2000s, archeologists have discovered and done initial studies of five human-built foot- or sandal-shaped constructions that have been dated to the same general time period as the Israelites’ conquest of the Holy Land. Pictured here is the best-known one, named in modern times “Bedhat esh-Sha’ab.” It is located just southwest of the Argaman settlement in the Jordan River valley, about two-fifths of the way from the Dead Sea to the Sea of Galilee. 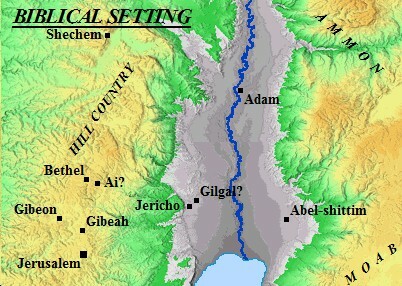 To put this in Bible terms, Bedhat esh-Sha’ab is a little northwest of the town of Adam on the map above. Why is this significant? Because when Joshua and the children of Israel crossed the miraculously dried-up Jordan river to enter the Holy Land, Adam and its neighboring city of Zarethan to its north are named as the location where the Jordan River’s “waters flowing from above stood still, rising up in a single heap” (Joshua 3:15–16). Why were these “gilgals” in the shape of feet, or sandals? And what does this shape have to do with the Bible story? In Deuteronomy 11:22–32, God promises the Israelites that if they obey his commandments, “Every place on which you set foot shall be yours.” Tantalizingly for our theme, these verses also contain the very first brief mention of a “Gilgal” in the Bible. 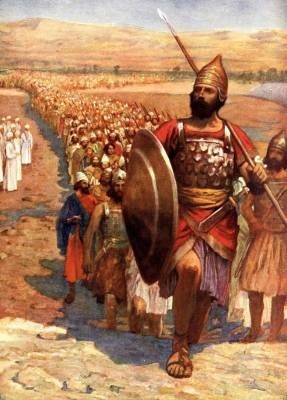 In Joshua 6, all the Israelite warriors are commanded to “march around the city seven times,” once each day for seven days, led by the priests carrying the ark of the covenant. This was an unmistakable signal to the inhabitants of Jericho that the Israelites were laying claim to their city. After the seventh day of marching around the city, the Israelites invaded and captured the city. In Joshua 10:16–27, Joshua ordered the commanders of the army to put their feet on the necks of five defeated king as a sign of victory over them. The kings were then executed, and the Israelites took control of their territories. The foot-shaped stone sites, perhaps built by the Israelites during this time period, may have been symbols of their declaration of ownership and control of the land, and their defeat of its previous inhabitants. It is likely that these foot-shaped “gilgals” were used for sacred observances and rituals. One of those rituals, scholars think, may have involved a ceremonial walking around the borders of the site, reflecting the practice of walking around a parcel of land to claim ownership of it. There are many other Biblical tie-ins with these foot- or sandal-shaped gilgals. But these are enough for now. It should also be mentioned that these foot-shaped gilgals commonly had smaller circular arrangements of stone within them that were probably used for sacrifices and other ceremonial purposes. In short, even though these sites are not technically circular, they invoke the circles represented by the Hebrew word gilgal in a number of ways, including being stone enclosures, the ritual of walking around their borders, and the circular stone objects commonly placed within them. These recent discoveries throw a whole new light on what the Bible means by “Gilgal”! What happened at the gilgals? We don’t know how many gilgals there were in the Bible, or exactly where any of them were. However, we don’t need to know all of the historical and archeological details in order to understand the cultural and spiritual significance of the gilgals, or stone circles, in the Bible. We only need to read the stories of what took place at these important sites. Though the gilgals certainly have a strong ritual significance in the Bible, they have an equally strong association with military conquest, and with new beginnings. We don’t have time or space to cover all of the events described in the Bible as taking place at Gilgal. When we look at the significance of Gilgal in the Bible, we’ll focus on the initial story of the Gilgal mentioned in Joshua. A base camp for many battles of the Israelites against their enemies. A sacred site that eventually became corrupted, but was still important in Israel’s history. Like Bethel, by the time of Jesus, Gilgal had faded into insignificance. It is not mentioned anywhere in the New Testament. And like Bethel, Gilgal relates to new beginnings in our spiritual life. However, Gilgal has its own spiritual significance, distinct from that of Bethel. The journey starts at Gilgal not just because that happened to be where the Israelites first landed in the Holy Land, but because of the symbolism of Gilgal as pictured in the Bible. Like our first impressions of someone that we’re meeting for the first time, the first occurrence of any person, place, or thing in the Bible tends to put its stamp on its meaning. In the Bible, Gilgal is stamped with the meaning it took on in the first major stories about it. Those stories are about its role as the first place that the Israelites camped in the Holy Land after crossing the Jordan River on dry land. What did Joshua’s Gilgal look like? Joshua 5:9 says, “Then the Lord said to Joshua, ‘Today I have rolled away the reproach of Egypt from you.’ So the place has been called Gilgal to this day’” (emphasis added). The Hebrew word gilgal means a wheel or circle, or something that rolls. The name “Gilgal” has traditionally been associated with stone circles and sacred enclosures that exist in and around the Holy Land. Recent archeological discoveries have turned up a number of large stone enclosures that seem to have had sacred uses. Though the enclosure is often foot-shaped, there are also smaller stone circles or circular mounds within them that served as altars or perhaps as tombs. All of this points to the likelihood that Joshua had his men set up those twelve stones in a circle. Perhaps it was Joshua’s army that built the various foot-shaped stone enclosures that have been discovered in Palestine. These “gilgals” may be the strongest archeological evidence to date that something like the conquest of the Holy Land by the Israelites—which many secular scholars have considered a cultural myth—may have actually taken place historically. As fascinating is it is to speculate on these ancient circular and foot-shaped gilgals in the Holy Land, the Bible itself provides all we need to know to understand the spiritual significance of Gilgal for our own life journey. It also provides what we need to know in order to understand why the journey starts from Gilgal both in Joshua 4–5 and in 2 Kings 2. Remember, like the parables of Jesus, the entire Bible speaks to us through the use of “correspondences,” or physical imagery that speaks of deeper spiritual realities. It was marked by twelve stones. Its twelve stones are associated with the twelve tribes of Israel. They came from the middle of the Jordan River. They came from the place in the river where the priests carrying the ark of the covenant were standing. They were set up at the first place where the Israelites camped overnight in the Holy Land. The twelve stones were placed there as a lasting memorial of the power of their God, who dried up the Jordan River so that the Israelites could cross over on dry ground. The encampment at Gilgal became the Israelites’ base of operations for their initial conquest of the Holy Land. We can’t cover all of these facts in detail. In fact, if we were to try to fully understand all the depths of meaning in even a single verse of the Bible, we would never reach the end of it. However, if we sketch out the significance of the stones, the Jordan River as an entryway into the Holy Land, and the conquest of the Holy Land, we can create a vivid snapshot of the meaning of Gilgal in our own spiritual journeys today. Stones appear prominently throughout the Bible—and they embody a deeper spiritual meaning. Wherever they appear with a positive connotation, we can think of them as representing bedrock truths on which we can safely found our beliefs and our life. In the Old Testament, one the most vivid examples of this correspondential meaning of stones is the fact that the Ten Commandments were written by the finger of God on two stone tablets. The Ten Commandments are the most central and sacred laws given in the Old Testament. So much so that they were placed in the ark of the covenant, which occupied the most holy place in the ancient Jewish Tabernacle, and later in the Temple. They were written in stone to signify that these commandments embody basic, everlasting laws of divine truth for us to live by. In the New Testament, when the apostle Peter said of Jesus, “You are the Messiah, the Son of the living God” (Matthew 16:16), Jesus said of Peter’s statement, “on this rock I will build my church, and the gates of Hades will not prevail against it.” (He also made a play on words with the name “Peter,” which means “rock” in Greek.) For Christians, the belief that Jesus is the Messiah (Hebrew for “anointed one”) or Christ (Greek for “anointed one”) and the Son of God, is the bedrock truth of the entire Christian faith. From these and many other examples of stones in the Bible, we can understand that the stones of Gilgal represent the simple, basic beliefs, or truths, that form the foundation of our spiritual faith and life. However, these were not just any old stones. These stones came from the middle of the Jordan River, from the very spot where the priests were standing with the ark of the covenant. What does the Jordan River mean spiritually? For the ancient Israelites, the Jordan was their introduction into the Holy Land. To get into their Promised Land on the route that they were traveling, they had to cross the Jordan. For Christians, the Jordan represents introduction into the Christian Church. Because that’s where the first Christians became Christians through baptism: “John the baptizer appeared in the wilderness, proclaiming a baptism of repentance for the forgiveness of sins. And people from the whole Judean countryside and all the people of Jerusalem were going out to him, and were baptized by him in the river Jordan, confessing their sins” (Mark 1:4–5). Jesus himself was also baptized by John at the beginning of his ministry, as an example for all to follow (Matthew 3:13–17). When the rain of God’s teaching gathers together, it becomes rivers of truth. And the Jordan River, because of its special significance in the spiritual life of both Jews and Christians, represents the truth that introduces us into “the heavenly Canaan,” which for Jews is the Holy Land, and for Christians is the Christian Church . . . and for all good people in due course, the angelic community of heaven. If you are a person of faith, or are following a spiritual path, what were the basic beliefs that introduced you into a spiritual life—or into the church, if you are a churchgoer? Was it the laws of the Ten Commandments as a guide for honorable life? Was it the realization that you must repent and reform your life or die? Was it the conviction that you must love your neighbor as yourself? Was it a belief in Jesus Christ as your Lord and Savior? These and many other basic, fundamental religious and spiritual beliefs have the power to introduce us into a spiritual or religious life from our former worldly and secular life. For each one of us, the stones of Gilgal, taken from the River Jordan where the feet of the priests had stood, represent the “sacred circle” of basic beliefs, or teachings of truth, that provided the miraculous passage through our own spiritual Jordan from our former ways of spiritual enslavement and death to our new ways of spiritual life. Your family and friends didn’t recognize you anymore, and didn’t respect the new you. Your old habits and addictions came roaring back, leaving you disoriented and disheartened. You discovered that you are not as good and nice a person as you thought you were. You realized that this new, spiritual life requires some major internal battles against the old you. What do those battles have to do with Gilgal? Gilgal, as we have already seen, was the base camp from which Joshua and his army conducted their initial conquest of the Holy Land. And Gilgal represents the basic religious truths that introduce us to a spiritual life, or to the church. If we are to be victorious in our early battles to set aside our old selfish, materialistic self, which was enslaved to various worldly desires and pleasures, we must continually return to those basic beliefs and teachings that got us going on a spiritual life in the first place. If we are tempted to go back to our old cheating, dishonest life, we must return again and again to the commandments that say, “You shall not murder. You shall not commit adultery. You shall not steal. You shall not bear false witness against your neighbor” (Exodus 20:13–16). If we slide back into our old addictive ways, we must once again heed the Bible’s call to repent (Mark 1:4), and to choose life over death (Deuteronomy 30:19–20). If we find ourselves once again thinking of ourselves first, and everyone else second, we must remind ourselves that the second Great Commandment is to “love your neighbor as yourself” (Leviticus 19:18; Matthew 22:39). If, as Christians, our faith begins to wane, and, like the apostle Thomas, we begin to doubt, we must reaffirm our faith in Jesus Christ as “my Lord and my God” (John 20:28). What basic beliefs drew you into a new, spiritual or religious life? These are your “stones of Gilgal,” to which you can return again and again to steel yourself for the battles of life that you must fight both within your own mind and heart and in your relationships with your fellow human beings. There may come a time when, as Jesus says, “our yoke will be easy and our burden light” (see Matthew 11:29–30) in living a spiritual life. But especially in the early days, it is a battle. And we fight that battle using those simple, basic true beliefs that first introduced us to a spiritual life. They represent our Gilgal. Why does the journey start from Gilgal? Gilgal was the Israelites’ first foothold in the Holy Land, and their base of operations for the initial conquest. Later, the center of their culture shifted to farther inland. From the low ground in the Jordan river valley where Gilgal was located, it moved eventually to the heights of the mountain on which Jerusalem and the Temple were built. In the very same way, later on in our own spiritual journey we must move on to a higher, more complex and nuanced understanding of the Bible, of Jesus Christ, and of the meaning of a spiritual life. We must move from the Gilgal of a basic understanding of spiritual life to a more developed and complex Jerusalem of mature spiritual life. When we do reach that stage of our journey, those simple, basic truths will no longer be enough for us. If we are unwilling to journey higher in our spiritual life, but remain stuck in those old, simple, black-and-white laws, our “Gilgal” can become a place of corrupt idol worship, as it had become when the prophets Hosea and Amos railed against it (Hosea 9:15–17, 12:11–14; Amos 4:4–6, 5:1–6). Even so, it all starts in Gilgal. It all starts out with those first, fundamental true teachings that introduced us into a spiritual life. And the final mention of Gilgal in the Bible is a poignant reminder by the prophet Micah of the simplicity and faith of our early beginnings with God (Micah 6:1–5). No matter how fancy and developed our spiritual beliefs and practices may become, those basic beliefs that were the starting point of our spiritual journey are never out of date. Even if we no longer spend our days in them, they still form the foundation of our spiritual life. The journey starts with the stones of Gilgal because we need a lasting foundation of basic principles of truth on which to build the superstructure of a mature, well-developed spiritual life. What does Gilgal mean for you? What are the basic stones of truth that form the sacred circle from which your spiritual journey started? See also: What is the History and Importance of Bethel in the Bible? ‹ Did Jesus Really Die to Pay the Penalty for our Sins?!? Thank you, Lee. That is a very interesting and helpful essay. Thanks for stopping by. Glad you liked the article! Your name is familiar. Are you a long-time Swedenborg reader? Thanks for dropping by! Best blessings to you as well. After reading this, I was very stirred in my spirit to dig into what Gilgal meant and why Samuel would make this declaration! I found your insight and work on Gilgal to be profound and want to thank you so much for providing it to us!! Thanks for stopping by, and for your good and kind words. I’m glad you found the article helpful and inspiring! Godspeed to you in your spiritual journeys. thats what brought me here as well. Bro. This essay is so unbelievably thick. I’m going to have to read it a few times to really ingest it. First read was eye opening and inspirational. Thank you. Thanks for stopping by, and for your comment. I’m glad this article is giving you some solid food for thought! Amazing biblical truth, I have read this history&promoted my spiritual knowledge! If you are volunteer please attach other commentaries on Holy Bible! Thanks for stopping by. Glad you enjoyed the article! If you look through the site, you’ll find many others on Biblical subjects. If you have a question about a particular story or passage in the Bible, feel free to submit a spiritual conundrum. Good Afternoon Sir, can u please explain Elisha’s bethel moment for me? About Bethel, I invite you to read the article, “What is the History and Importance of Bethel in the Bible?” If, after reading it, you still want more specifically on Elisha and Bethel, please do let me know. Great article inspired my spirit. Thank you, Pst. Manase Mhana. Glad you enjoyed it! Tithing, which is giving a tenth of one’s possessions or income to the church, is an ancient practice, commanded in various places in the Old Testament, and mentioned in passing in the New Testament, mostly in relation to those Old Testament commands about it. It was meant to be the primary support for the Levites, who served the Lord at the ancient Jewish Temple as priests and in various other ways. Most Christians do not believe that Christians must obey the various Jewish laws found in the Old Testament. However, some Christian churches, especially conservative ones, either request or require their members to tithe to the church. This may be a literal tenth of a person’s income or it may be some other figure, such as 5% instead of 10%. My own view is that for Christians today, whether or not to tithe, or to make any other donation to the church or to charity, is a personal decision, not something that should be considered a mandatory commandment of God. The money we are paid is a compensation for the work that we do. And as Jesus said, workers deserve their wages (Luke 10:7). It is our choice whether we will devote some of what we earn to our church or to charitable organizations. And while it is good to do so, once again, I believe it is a personal choice that we must each make based on our own situation and on what our heart moves us to do. For some people, contributing their own labor, or simply doing good deeds for others in their daily lives, is a more meaningful way to love their neighbor as themselves. Thank you for this information. It’s true. That’s exactly how OUR DEAR FATHER GOD PUT IT UNTO MY HEART. Thank you very much for your great efforts of unpacking this incredible information. Hi Lee and Annette, I was praying a couple weeks ago and the spirit of God whispered in my ear Gilgal and gave me the scripture Joshua 5:9. I was going through a little battle, a little church wound. Needed to hear from God, then I researched and came across your writings and to God be the glory it helped me to understand what the spirit of God was saying. May God bless and favor you both in this season. I pray a double blessing on your ministry and household. Thanks so much for your thoughts and prayers. I’m very glad that this article helped you with your current spiritual battle. May God be with you. This rich and insightful. Thanks Lee for making yourself available for the master’s use to be a blessing! Thanks for stopping by, and for your kind thoughts. I found your article and explanation on Gilgal very interesting and educative. Can we call Gilgal a place of victory or a safe abode? I agree with you that to make donation is a personal decision but tithe is a command as stated in Malachi 3 : 10a. It says “Bring all the tithes into the storehouse, That there maybe food in My house” (NKJV). The word “BRING” is a command that is expected of all Christians to obey. Please you can send your reply to my question on Gilgal to the email address I provided as well as any response to my contribution on tithing. Thanks for your comment and question, which I’ll answer here rather than by email. Gilgal could be called a place of victory, not because battles were fought there, but because it was a base of operations for the Israelites’ early battles, and a place where they celebrated victory after some of their battles. As a place associated with war and battle, Gilgal would not normally be thought of as a place of safety–except, perhaps, for the consideration that some wars might secure the safety of the people in the land. About tithes, if you see them as binding on Christians, I would certainly recommend that you faithfully make your tithes to your church! However, there are many commandments in the Old Testament that are no longer binding upon Christians–including the laws of sacrifice and the other laws associated with the tabernacle (and later with the temple), among which were the tithes. Thanks for stopping by, and for your kind comments. You are most welcome. Spiritual meaning of Gilgal was really useful for my Bible study. Thank you. Many blessings to you. The importance of the spiritual significance over the literal is so important, “For the letter killeth, but the spirit giveth life” (2 Cor 3:6). In reading Hosea I was struck by the claim, “All their wickedness began at Gilgal” (9:15) (NLT). I always thought of Gigal as a place to be celebrated. My question is, could Hosea be hearkening to the idea that the Children of Israel starting to be sustained by the “produce of the land” (as you wrote) instead of continuing to rely on the heavenly manna? (or as I have come to spritually see bread as the Christ–the bread of Life) Notice the manna does not cease until they have eaten of the old corn of the land (Josh 5:12). Hosea often writes about the Lord’s displeasure with Israel’s human footsteps for wealth and prosperity without giving thanks to Him for it. Thanks for stopping by, and for your comment. Fascinating stuff! I would suggest that the prophecies of Hosea and Amos against Gilgal were probably for later corruptions of those sites. See Hosea 12:11-14; Amos 4:4-6, which seem to connect Gilgal with corrupt worship at that site, taking place later in Israelite history, during the time of the prophets. Keep in mind that most of the prophets prophesied during the later period of the divided kingdom, after the time of David and Solomon. However, it could also be speaking more broadly of the Israelites’ slaughter of the people of the land. In the text itself, this is commanded by God. But some later views would say that this was “because of the hardness of their hearts,” and that the conquest of the Holy Land by brutal warfare was a testimony to their desire for blood, death, and destruction of their enemies. This, though, would certainly fly in the face of most traditional interpretations of scripture. There are inklings in the prophets that the Israelites were more pure when they were living simply in the desert, sustained by the manna from God, and that they became more urbane and more corrupt when they entered the Holy Land and began living by their own means instead of being directly sustained by God. All of this is very tricky. In my view, it becomes clearer when we interpret the Bible spiritually, as relating to our own spiritual journey and growth, than if we attempt to interpret it literally as being about the history of the Israelite people. And certainly an attitude of thankfulness to God for our blessings, both material and spiritual, is an essential part of our spiritual path. We have just completed our fifth year in business and God had impressed Gilgal on our hearts as we convened to seek God’s face as we transition into another new financial year. The insights in this article have greatly blessed us. Thanks for stopping by, and for your comment. Congratulations on five years in business, and best wishes for the coming years! I’m glad this article was meaningful to you. You’re very welcome. Glad you enjoyed the article! And good luck with your shop. Thank you for taking the time to put all of this information online. You’re welcome! Thanks for stopping by, and for your kind words. God bless you Lee for these amazing study. I was posted to pastor a local church of my ministry, though an old church established over 15 years but still had a small member congregation and was really troubled when I first got there. I had to start looking into The bible to know the significance of Gilgal as the name the parish bears. I just know one thing that biblical names have a lot to do with destiny of a man or purpose and your study has really opened me up into lots of discoveries why the church has the name. Personally I know a name has a lot to do with destiny and I need to know what Gilgal stood for as ordained for the church. This church by God’s grace is back on track with God’s Mercy and Grace and improving by the day. A new beginning is the covenant God has established with me for the church. Thank you sir for sharing your God given understanding. God bless you recall good. Thank you for stopping by, and for your kind words. I’m glad the article has helped you see new meanings in your church and its name! We wish you God’s blessings in your ministry. I was reading this morning in Hosea 9:15 where I saw, “All their wickedness began at Gilgal; there I began to hate them.” (Living Translation). So I thought I should contemplate more on what is “Gilgal?” This led me to your inspiring and insightful article. Do you think Hosea is referring to Israel’s wickedness even as they prepared to cross the Jordan? Thanks for stopping by, and for your kind words. I’m glad the article is helpful to you! The ancient Israelites certainly were a brutal and warlike people, and not spiritual at all. Of course, most if not all of the other nations and races in those times were the same, if not worse. Those were dark, brutal times in the spiritual history of humanity. So yes, although the Scriptures do set the ancient Israelites up as a holy nation, it also makes it clear that they could hardly fulfill that role because they were a “stiff-necked” people. That is why they were constantly disobeying God and suffering punishment for their disobedience, and why eventually their nation was destroyed and they became captives to other nations and empires. At least, that is what the Bible narrative itself tells us. I say this not to cast aspersions on the ancient Israelites. As I just said, they were no worse than the other nations and races of the time, and God did choose them as the nation through which the Hebrew scriptures would be given. And that, I would say, is because they very well represent the spiritual state of each one of us when we first begin our journey from evil and self-centeredness toward a good and godly life. We don’t start out in life as shining examples of love and selflessness. We start out thinking mostly of ourselves, and we often begin our journey toward spiritual life in order to save our own skin and get good things for ourselves. For more on this, see the companion article, What is the History and Importance of Bethel in the Bible? In other words, if we’re inclined to condemn the ancient Israelites for being unspiritual and brutal, we might as well direct our criticism to our own souls as well, because that is where we all start out spiritually. The story of the Bible, spiritually understood, is the story of our journey of rebirth, or regeneration, from being low, materialistic, selfish, and often brutal people to being lifted up by the Lord to spiritual light and life in which we love God above all, and love our neighbor as ourselves. For more on this, see our article, Heaven, Regeneration, and the Meaning of Life on Earth. Crossing the Jordan represents our first introduction into spiritual life. And when that happens, we are not good, but evil people. That is why we need spiritual life in the first place. So the wickedness of Israel at Gilgal represents the wickedness from which all of us start our spiritual journey toward God and goodness. Yes, as mentioned in the article, the Hebrew word gilgal means to roll, or a circle. And though in the article I focused more on its meaning as a circle or wheel, you are right that it also carries the meaning of “rolling away” disgrace, difficulties, reproaches, and so on, as reflected in Joshua 5:9. The Bible has many layers and angles of meaning! From what I have been taught, Gilgal is a dead church. One going in circles. Gilgal is part of the way and would be like the outer courts of the temple. In 2nd Kings chapter 2 it talks about Elijah and Elisha and every time Elijah tells him to stay is a test to see if Elisha will follow just like we have tests to see if we are followers of Jesus. Like all of the other symbolism in the Bible, Gilgal can have both a positive and a negative meaning, depending on the spiritual state of the people involved. Gilgal certainly can mean a dead church that is going in circles. But it can also mean a church founded on the basic, tried and true principles of spiritual living in a way that goes “full circle” to encompass the whole life of the church. The massage you posted about gilgal in 2014 is read by me today 17/1/2016 because something led me to start thinking about gilgal. indeed, you made a wonderful Xray of gilgal. your writing is helpful. more grace and God bless you sir. Thank you! I’m glad you found the article inspiring. God’s blessings on you as well! Spirit filled writing. Thank you for allowing the spirit of God to use in this manner. I now understand Gilgal in much angles than before. God bless you, your family and monistry. Thanks for stopping by, and for your kind words. I am glad this article provided new light and enlightenment for you on Gilgal. We have a small Bible study of 14/15 and Friday we went over the lesson for tomorrow (3/6/16) re. Gilgal. Since then at least a couple have looked Gilgal up on Google and that include your work passed on to me. Nicely done and presented in a manner even one in their Gilgal could follow. As to tithe: my sense is that the first 10% belonged to the temple and the SECOND 10% was ones offering. I think the Mormons do it this way. Any comment? I did my graduate work at Hebrew Union College (some 9 years) after seminary, I’m getting ancient but this morning is another Gilgal for me in my old age. Thank you very much. Thanks for stopping by, and for your kind words. I’m glad the article was helpful for your Bible study! I’m not aware of any references in the Bible to making two different tithes. But I haven’t made a special study of it. I have enjoyed your great insights and study on Gilgal. I am teaching the book Joshua to 5th graders and came across your article. God bless! Thanks for stopping by, and for your kind words. I’m glad the article will be helpful to you in teaching your class! Thank you! May God’s blessings rest upon you and yours as well. I have been reading the Book of Joshua for a couple of days and the word “Gilgal” had not yet attracted that much of my attention until a got to the 43th verse of chapter 10. I started wondering what was peculiar about that place. Thank you so much and God richly bless you, because you have answer to my question. Thanks for stopping by, and for your kind words. I’m glad the article was helpful to you on your spiritual journey! Thank you for stopping by, and for your good words. Godspeed on your spiritual journey! We used the word Gilgal to pray in church today and decided to read more on it and I came across your information. Thank you for taking the time to put all of this information online. Excellent work.nGod bless. Thanks for stopping by, and for your kind words. I’m glad the article was helpful to you and your church group. Godspeed on your spiritual journey! Could you go through the issue of divorce and remarriage from the biblical point in a situation where a husband left his wife for another woman (not because wife committed adultery) and the wife wanted reconciliation and husband said he’s moved on. Being in her 30s, Wife would love like to remarry some day. Can the wife remarry, God hates divorce and bible says who ever marries a divorcee has committed adultery. Thanks for stopping by, and for your comment. You’re very welcome! I heard real meaning of Gilgal from my professor, Dr. Widbin but I forgot about it and your article is even clearer to me. I have been reading Ehud’s story so many time but never knew he went to Gilgal and came back. So i was wondering why did he go to Gigla and came back. Now I know that he might have had a ceremony for the victory over Eglon and announce a new begginings. Thank you. Thanks for stopping by, and for your comment. I’m glad this article was helpful to you! Thanks for stopping by, and for your comment. I’m glad the article spoke to you! Sir, one of my buddies thinks Gilgal is information, meaning that gilgal represents knowledge and the pursuit of it. Any idea why he thinks that or if there is any Biblical backing? He tried to explain it, but I did not understand and it was unlike anything you have here. Though your friend’s understanding of the meaning of Gilgal has a somewhat different focus than what I presented in the article, it’s not entirely different. So if the “knowledge” that your friend speaks of is the pursuit of knowledge about the basic teachings of spiritual life, as compared to secular knowledge, then his view is compatible with what is presented in this article. Did your friend say where he got this belief from? Thanks for that great spiritual insight and revelation.To God be glory.Kindly was Elijah taken up to heaven by wheelwind in gilgal or Jordan? By reading your insight you are mentioning gilgal as where he was taken by wheelwind. As stated farther along in the article, the journey on which Elijah was taken up in a whirlwind to heaven started in Gilgal. But Elijah and Elisha traveled from there to Bethel, then to Jericho, and then across the Jordan from Jericho, where Elijah was taken up in a whirlwind at some place that is not named. You can read the whole story in 2 Kings 2:1-18. God is so amazing. Our church sets two weeks of prayer and fasting to prepare 2017 in prayer with God and the book of Joshua was chosen as the book to read. When I reached Joshua 4: 19 down to Joshua 5:1-12, the Spirit Of God opened up my mind to understand the importance of Gilgal as first place where the Israelite camped after crossing over river Jourdan and all things that took place. I have come to discover how Gilgal is very important in our spiritual walk and must be the first place to stop priory to all our conquests in life. Coming online and seeing how God has already inspired his Servant with these great revelations, left me without words. Thanks man of God for this great work by which, you have given me more insight on this subject. This came to confirm what God was pouring into my mind. Thanks Holy Spirit of God, our great teacher!!!!!!!!!!!!!!! Thank you for stopping by, and for your kind and gracious words. I’m glad the Spirit has spoken to you and guided you to greater and deeper understanding of Gilgal. May God richly bless you and your ministry and your congregation! Thanks for stopping by, and for your comment. You are most welcome! My God bless your church and your ministry. Thank you! Godspeed on your spiritual journey. This article is excellent (with manifold spiritual nuggets) and comprehensive, it opened my eyes to a lot of other considerations. 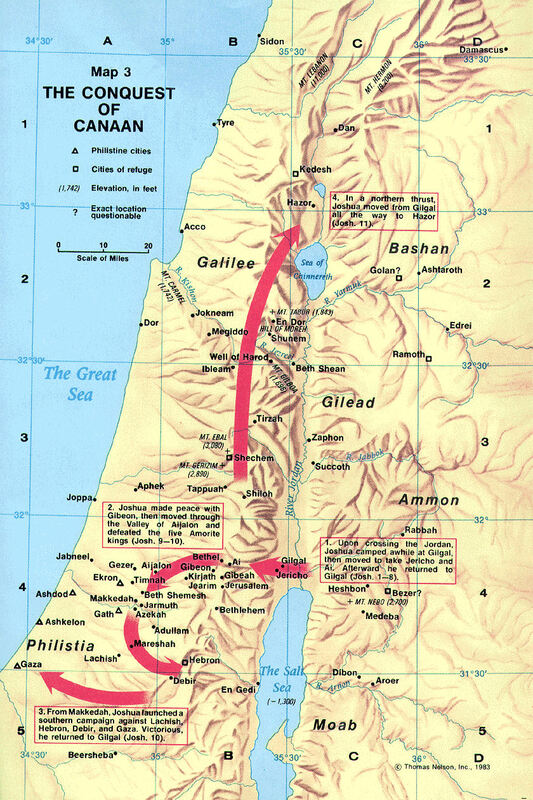 For many years I have wondered what and why it was said that the journey starts at Gilgal then moves to Bethel and ends after crossing the Jordan. May the Lord God Almighty continue to bless you richly in the mighty name of Jesus Christ, Amen. Thanks for stopping by, and for your kind and gracious words. i believe that every christian should be a child of information. and here , i am greatly informed. Thanks for stopping by, and for your comment. I’m glad you found the article helpful and informative! This was absolutely amazing! By the direction of the Holy Spirit, I am now studying the last journey of Elijah with his mentor Elisha. I knew each stop had a meaning but Gilgal was only the start and now I know why! Simultaneously I am also studying the exit of the Jews from Egypt through the Red Sea and their first stop at Marah (bitter) before they could go on to Elim ( of which I can’t wait to study its meaning!) where there were 12 springs and 70 palms trees waiting for them. Somehow the Holy Spirit is entwining these two stories together for me for my personal growth and I am so excited! Its so comforting to know that the Word of God is real and very relevant for our lives right now in the present! Thank you again for sharing such awesome light on this for me! Blessing on you and your ministry in Jesus name! Thanks for stopping by, and for your kind words. I’m glad you found this article so helpful and enlightening! May God richly bless you on your spiritual journey. Thanks for stopping by, and for your comment. Glad the article was helpful to you. Godspeed on your spiritual journey! Thanks for stopping by, and for your comment. Glad you found the article inspiring! Godspeed on your spiritual journey.